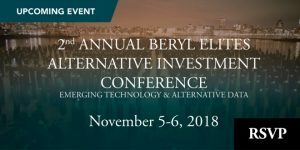 On Monday and Tuesday, November 5th and 6th, 2018 the Beryl Consulting Group will be holding its 2018 ALTERNATIVE BERYL ELITES INVESTMENTS CONFERENCE. This year’s conference will be focused on emerging technologies and alternative data, as well as other relevant topics in the alternative investments arena. Many firms in the financial services industry are being disrupted by a number of key emerging technologies, including artificial intelligence, alternative data, blockchain, and digital media. 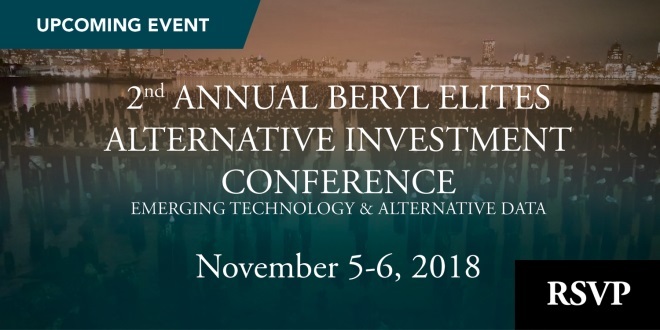 The panelists for this year’s Beryl Elites conference will discuss the most thought-provoking themes, salient trends, and biggest investment opportunities surrounding these technologies that are revolutionizing our industry. Besides offering unique content, the Beryl Elites conferences provide extensive networking opportunities and live entertainment on Monday evening. This year’s event will take place at the Cutting Room on 44 East 32nd Street, New York City, NY. Firms interested in learning more about sponsorship packages for this year’s conference, click here. Participants interested in attending this year’s Beryl Elites conference click here to purchase tickets. Integrity ResearchWatch readers are eligible to receive a 20% discount on all ticket purchases made for this year’s conference. Those interested in speaking with Beryl Consulting to discuss discounted tickets, speaking opportunities, or sponsorships, please reach out to Alva Lin at alva@berylconsulting.com.